Naz Legacy Foundation, St Paul’s Cathedral and the City, invite you to a very special youth interfaith Iftar, hosted in one of the most iconic buildings in London with The Bishop of London, Rt Revd and Rt Hon Dame Sarah Mullally DBE on Tuesday 7th May 2019. For three-years running, The Naz Legacy Foundation in partnership with The Randeree Charitable Foundation and Pears Foundation, have presented an annual Interfaith event, centred around an Iftar. Over one hundred young Londoners from different faiths, or none, come together to discuss their faith and how to bring different communities in London together within a spirit of community, unity and public service. Each year this is held in a different religious location across London. Summative evaluation was undertaken at these events. This provided immediate feedback on the impact and reception of the event. These evaluations demonstrated that the events were successful in enthusing and inspiring young people to want to pursue further social action and/or interfaith activity immediately following the Iftar event (on average 93% agreed or strongly agreed that they would like to take part in more social action projects). -73% of the young people were able to transmit knowledge that they had learned at the Interfaith Iftar to others. -64% of the young people were instrumental in encouraging other people to attend another Interfaith events. -47% of the young people actively sought out ways to engage people from other faiths in further action or networks following the event. The Foundation organised for 66 young people to visit the First Waves Exhibition that celebrates the introduction of the first Race Relations Act in UK Parliament 50 years ago. The exhibition looks at the impact the Act had on minority Community. The young people then took part in a Q&A session with Nusrat Ghani MP (Minister for Transport) , Dawn Butler MP (Shadow Minister for Equality and Women) and Jo Swinson MP (Deputy Leader of the Liberal Democrats). The young people ended the day with a visit to the public gallery to witness democracy in action in the House of Commons and a visit to 10 Downing Street. To commemorate 100 years of the 1918 Representation of the People Act, and 90 years since the Amendment of the Representation of the People Act that created equal suffrage between men and women, the Aziz Foundation, National Trust and The National Archives created an immersive experience entitled Suffragette City. 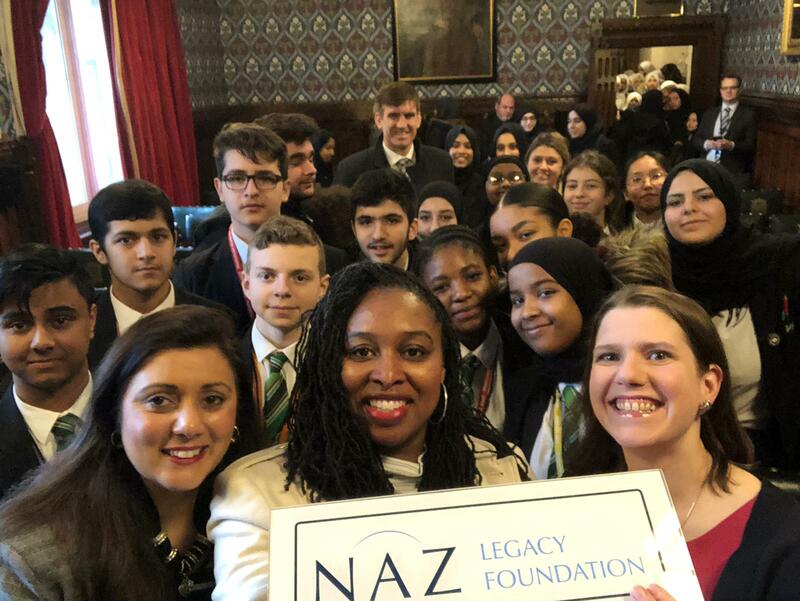 Naz Legacy Foundation supported 60 school children from three schools to partake in the Suffragette City. · The schools that have taken part are situated in the top 10-40% most deprived areas in England. 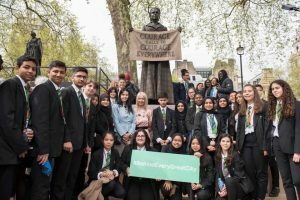 · 84% of the pupils had not previously heard of the suffragette campaigner Princess Singh and her role in the movement. · 89% of the pupils who attended two or more of the events felt inspired to find out more about some of the issues and topics covered by the events. The same number felt that attending the events had increased their knowledge and understanding of the topics covered. · 83% of the pupils felt confident that attending the events had increased their interest in history. Naz Legacy Foundation organised an Interfaith Iftar hosted at the St John’s Wood Synagogue on Wednesday 30th May 2018. Speakers included Chief Rabbi of the United Hebrew Congregations of the Commonwealth, His Eminence Cardinal Vincent Nichols, Bishop of London and the Mayor of London, Sadiq Khan. The event empowered and raised the aspirations of 150 young people aged 18-30 years old (the average age was 24), representing all 32 boroughs of London, from all faiths and none and provided wonderful opportunity to celebrate faith in the centre of our vibrant and diverse capital. The young people came together to discuss how they best thought they could bring faith and non faith communities together in London for the betterment of all our communities. - 44% had never been to a synagogue. - 88% felt confident that they would keep in touch with people that they had met at the Iftar. - Over 50% young people from faiths that they had not met before despite living in multi-cultural London. This resulted in a 21%-point increase in the respondents’ knowledge of other faiths post-Iftar. - Overall 97% rated the Iftar as Good or Excellent. The Interfaith Iftar brought together one hundred young Londoners (aged 16-30) from different faiths, or none, to discuss how to understand each other’s perspectives and how to bring communities in London together. Each group had the opportunity to discuss their ideas within an allocated cluster group before taking up their main ideas with three distinguished speakers: Cardinal Vincent Nichols; The Chief Rabbi, Ephraim Mirvis, and Mayor of London, Sadiq Khan. - 96% of the young attendee respondents agreed/ strongly agreed that they felt positive about the Interfaith Iftar experience. - 90% of the young attendee respondents agreed/strongly agreed that they were inspired by the event. - 72% of the young attendee respondents agreed/strongly agreed’ that they would keep in contact with the people that they had met at the Interfaith event (there was some evidence of attendees adding ‘friends’ to their snapchats, exchanging emails addresses or directing attendees to relevant web resources – such as the Mitzvah day. The pre-Iftar evaluation revealed that 34% of the young attendees wanted to learn more about other faiths and wanted an opportunity to discuss their faiths with others. - An increase of 33% in knowledge about other faiths (agree & strongly agree) was evidenced from pre- to post- evaluation. - Pre-Iftar 57% felt confident that they were knowledgeable about faiths other than their own. This rose to 90% post-Iftar). Secretary of State for Education Rt Hon Damian Hinds MP awarded Sir Trevor Pears the Naz Legacy Foundation Honorary Education Fellowship 2018 at the 6th Anniversary Naz Legacy Foundation Reception 2018. The event, held at the prestigious No20, Mayfair, was hosted by KPMG Partner Siddiq Musa. 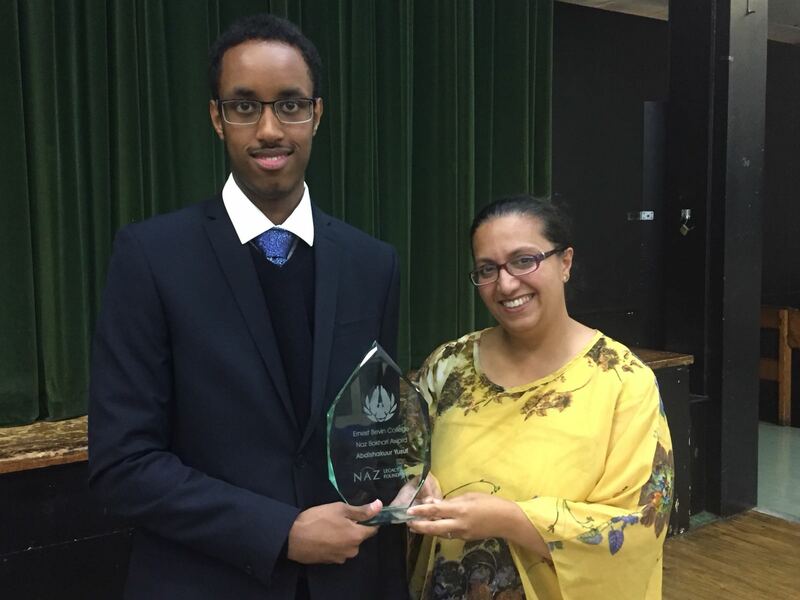 The reception brought together over 100 leading educationalists, philanthropists, politicians and youth leaders to celebrate the legacy of the late Naz Bokhari, the first Asian / Muslim head teacher in the UK. Students from Westminster Academy, London had an amazing experience at the The National Archives learning about the Princess Spy Noor Khan. An Indian born British agent, Khan was honoured for her bravery after being executed by the Gestapo in World War 2. The students were privileged to see original sources and genuine artefacts in relation to the Noor Khan and other notable BAME historical figures. A truly unique experience that everyone will remember for a long time. Click here to see the picture from the day. Naz Legacy Foundation organised an Interfaith Iftar hosted at the St John’s Wood Synagogue on Wednesday 30th May 2018. Speakers included Chief Rabbi of the United Hebrew Congregations of the Commonwealth, His Eminence Cardinal Vincent Nichols, Bishop of London and the Mayor of London, Sadiq Khan. The event empowered and raised the aspirations of 150 young people aged 18-30 years old (the average age was 24), representing all 32 boroughs of London, from all faiths and none and provided wonderful opportunity to celebrate faith in the centre of our vibrant and diverse capital. The young people came together to discuss how they best thought they could bring faith and non faith communities together in London for the betterment of all our communities – and a number of them are now putting plans together to implement their ideas.